There are several neighborhood cats which wander freely through all the yards. There is one who is nobody's cat in particular, he's the neighborhood's cat. He's been hanging around the house since we moved in, and we've been feeding him from the start. We call him Tux. Tux is an old kitty who has seen better days. We think Tux is a he, but since Luke is the only one who can hold him, and then only for a few moments, we're not completely sure. The battle scars on his face tell the story of a rough life. He's a cautious soul, slow to trust anyone. 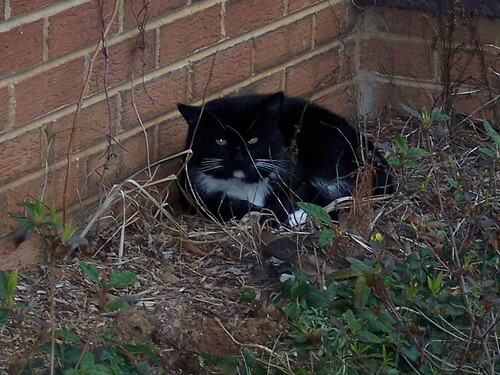 He prefers to sit on the front steps in the sun, or in the flower bed for shelter from the wind. People can go about their business and he's not disturbed, so long as nobody tries to approach too close. I have a online dating blog. It pretty much covers jewish dating service related stuff. 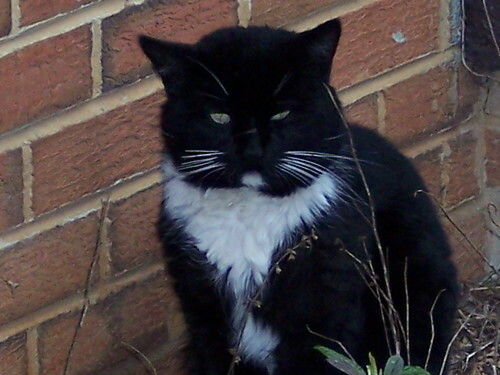 We used to have a tuxedo cat which came round to visit from a neighbours house. He used to scratch at the window to come in and then go and sleep on our bed. Have moved house since but really miss him, there's a new tux cat that passes through our garden but him and I have had words which ended up in me getting scratched so he doesn't come round anymore.